The Adel Neighbourhood Forum (ANF) has the following observations on the developer’s additional heritage assessment submitted in support of this application. We would expect our comments to be given equal prominence in any report to the Plans Panel report to those in the developer’s assessments . The developers of this site submitted a number of commentaries produced on their behalf by their sub-contractors which are referred to in the “sources” section. Those reports were far from objective, as one would expect, given the companies’ relationships as paid suppliers to the developer. Their comments were in stark contrast to the views expressed by the independent and authoritative experts of English Heritage and Historic England. It is noted that the author concedes that the pumping station will cause harm to the significance of Adel St John’s Conservation Area and the Grade 1 Church of St John the Baptist. The only justification given for the pumping station is that it can be constructed under the wording of the relevant planning consent. Our understanding is that the planning condition quoted was inserted by a Council Officer, and we note that it was done without the authority of the Plans Panel, and without any public consultation. We therefore consider that that agreement is unlawful; it is the subject of a formal complaint by an Adel resident. Again, the authors have made no attempt to address the heritage implications of the pumping station and associated culverting of the beck and concrete road. The author provides 15 pages of their opinion on how heritage assessment should be carried out and on planning law. There is no specific reference to the site in question, so whilst not necessarily accepting the author’s opinions, ANF has no comment. This report fails to make any reference to the probability of a Roman Road as shown by crop marks which extends north to south for the full length of the site west of the beck. It is therefore inaccurate and incomplete. There is nothing arbitrary about the statement of key views into and out of the conservation area; the appraisal document was thoroughly and expertly prepared. This is merely an attempt by Pegasus to denigrate the important provisions of the conservation area appraisal without any foundation in fact. PEGASUS STATEMENT: “ A view across towards the site from Church Lane is noted as an important long-distance view. It is acknowledged that there are views available from this point across and along the valley floor which add to the sense of rural surroundings, however the development will not remove or impact upon these views. The development as currently proposed will impact on these views by substituting a view of jam-packed bog standard BDWH houses for the current view of open farmland against a woodland background .The Pegasus statement is plainly untrue. ANF have consistently asked the developer to design something of better quality for this special site so that the alteration to the views will be less offensive. English Heritage advised: “ The design and materials used for the new buildings will affect the extent and nature of the visual impact of the development when viewed from the church. Therefore, ensuring the design and materials reflect the local built character will be a critical part of the reserved matters stage. High quality traditional, local materials should be used taking reference from the existing character of the settlement.” The views of ANF and of English Heritage have been completely ignored. We totally disagree. Of course the long views will be compromised. See above. The assertion that a pumping station (and associated concrete road) might be confused with an agricultural building is risible. It is precisely the sort of built development which the condition agreed by the Plans Panel was designed to avoid. Historic England has consistently opposed any built development east of the beck. The rural surroundings of the churchyard contribute much more than “ a minor amount to the significance of the [church]”. English Heritage’s expert assessment is completely contrary to this assertion by Pegasus and points to a completely different approach to understanding an asset in its setting to that put forward by the developer’s report-writer. English Heritage stated “ … the way in which we experience an [historic] asset in its setting is also influenced by….spatial associations…The setting of the Church of St John is a perfect example of this ; the appreciation and understanding of the building as a twelfth century rural church is enhanced by experiencing the peaceful nature of its setting and spatial qualities of the open fields as well as the visual impact of long-distance views incorporating green fields and vegetation”. ANF agrees with English Heritage’s assessment of the importance of the church, churchyard and their wider setting, including the views from the ancient footpath. The Pegasus statement shows a complete failure to appreciate the quality of the view of the church and churchyard when approached from the ancient footpath. This is a further attempt to ignore the importance of the rural setting of the church and churchyard. Of course the architectural and historic interest is important; but its open and rural context as noted by English Heritage is a unique survival giving it a special quality ; it must not be eroded by any development east of the beck. This is a misrepresentation of what Historic England wrote on 12 April 2017, not least insofar as Historic England was writing about the CURRENT rural surrounding of the church. Nowhere in the letter is there any reference to “former” rural surroundings. In complete contrast to the suggestion put forward by Pegasus, Historic England are reinforcing the point that the ancient rural surroundings of the church have survived-and must not be destroyed. The letter from Historic England should be re-read in full to put this Pegasus report in proper context. Historic England wrote “ We have consistently advised that no development should take place to the east of the beck”. Pegasus have put forward no argument or evidence at all to back up their suggestion that this consideration has been addressed. PEGASUS STATEMENT: “ The principal of the proposed development has been discussed in a number of heritage appraisals and assessments produced for the outline planning application. PEGASUS STATEMENT: “The proposed layout which forms part of the reserve matters application has been undertaken with the consultation comments received from Historic England and the Leeds City Conservation Officer in mind”. Pegasus has made no attempt to demonstrate how it has taken account of any of these comments. Our analysis shows that in fact, these comments have been completely ignored. Pegasus accept that the building a pumping station east of the beck flies in the face of advice, but their client intend to build it anyway because they have planning consent. Clearly Pegasus’s brief is to downplay the damage that this building will inevitably do. Although our understanding is that no plans of this structure have been made available (as stated in Leeds City Council’s own conservation team’s statement), Pegasus have attempted to fob off concerns by talking about it as “low level” and “not prominent” and that it is now taking on the form of an “isolated farm or agricultural building constructed in the local vernacular”? We consider that this statement is completely ridiculous. If Historic England had considered it was possible to mitigate the damage to the setting in this way, then it was open to them to say so: they did not, they were clear that there should be no building at all to the east of the beck. The suggestion that this building could be built in the “local vernacular” also raises the issue of why if BDWH have the ability to build in the local vernacular, they are refusing to do so for the whole development. “The proposed layout has been prepared in cognisance of the consultation responses for the outline planning application from historic England and the Leeds City Conservation Officer. In accordance with their statements, and in accordance with the conclusions of the various heritage appraisals carried out in support of the outline planning application, no residential buildings have been located to the east of the beck, the height of the proposed houses has been restricted to two-storeys and a large buffer of open land both within the red-line boundary of the development and beyond to Church Lane has been retained. Boundary treatments on areas facing towards the Conservation Area and the grade I listed Church of St. John the Baptist are proposed as 1.8m high stone walls, referencing local forms surrounding boundary treatments, with other boundaries formed by 1.8m high timber fencing. Therefore, due to the sensitive design of the proposed layout and lack of development to the east of the beck, barring the pumping station which was allowable via planning condition 20 of permission 16/06222/OT, it is considered that this reserve matters application would not cause any harm to the significance of the Adel St. John’s Conservation Area and the grade I Church of St. John the Baptist. Once again Pegasus clearly acknowledges that the pumping station WILL cause harm,and would only be permitted if the wording discussed with a Leeds City Planning Officer is permitted to stand. No evidence or arguments have been presented to explain the “sensitivity” of design, nor how high in the landscape any development will sit. This is a major failing of a document that purports to address these issues. Whilst “in cognisance of” demonstrates that the developer has seen the material generated by others, our conclusion is the developer has the proceeded to ignore it. Adel Neighbourhood Forum Comments on the report from Leeds City Council Conservation Team. The report is weak and incomplete. It simply makes unsubstantiated statements about the impact of the development, and offers no evidence for such judgements. These assertions are in direct contradiction to the many statements by English Heritage and Historic England, who have had much to say about the impact of development of this site on the setting of and important views from the Grade 1 listed church and conservation area. The report asserts that the impact on the Grade 1 Church of a pumping station east of the beck is likely to be minimal but goes on to admit that the author does not know what the pumping station machinery will look like. This assertion can therefore carry no weight. Further, the developer’s own commissioned report on heritage makes clear several times that the proposed pumping station will have a negative impact but simply goes on to claim that it has planning consent. The report also contains errors. For instance, it comments on an 1800mm fence around the pumping station. The only such fence shown in the site layout is to the north of the pumping station and does not enclose it. ANF objects to any such fencing in this location or anywhere east of the beck. Out of the numerous conservation issues relevant to the site, the report only addresses the proposed pumping station. For some reason that is not explained in the report, it does not cover any other relevant issues. Bio- diversity is being dealt with by my Nature Conservation colleague but the change from a pond offering multiple benefits including public amenity, public access and recreation is a significant loss to the quality of this scheme. This is being replaced by an underground tank with above ground apparatus all of which will sterilise the area. The original plan for the area should be restored and this will undoubtedly be supported by the Land drainage team. Yet the LCC Conservation Team report is completely silent about design, materials, density, greenspace or any of the other factors relevant to the visual impact from the church and conservation area. It just states – erroneously – that the previously raised conservation concerns relating to this site have been limited to development to the east of the beck. The developers are well aware that because of its impact on the church and conservation area, this development impacts on all residents of Adel, not just those whose homes adjoin the site. The limited distribution of leaflets was inadequate. The meeting on 11 May 2018 with councillors and ANF representatives was not for the purpose of consultation on these proposals. BDWH had not previously disclosed its proposals so any comment made on them when plans were tabled at the start of the meeting were very much ad hoc. The purpose of the meeting was to try to persuade BDWH to have some meaningful consultation with Adel residents before any reserved matters application following a complete absence of consultation at the outline stage. The circulation of the event at Adel Stables in June 2018 to 2000 households arose from the initiative of our local councillors. BDWH made no effort to publicise the event. It is not accepted that the Community Engagement Statement presents a fair representation of resident’s comments. We are aware that a number of residents objected to a pumping station and service road being placed east of the beck, yet this is not mentioned. We are sceptical that anyone asked for “ the pumping station to be positioned sensitively in relation to the church to ensure it is not visible”. Cconsultation should be a two-way exercise with BDWH responding to comments made by local residents and changing their plans to take account of reasonable points raised. There is no evidence of BDWH making or having any intention to make any changes to their proposals to take account of points made to them. The leafleting and public display of their proposals was no more than a box-ticking exercise. Please see below the response by the Adel Neighbourhood Forum to the reserved matters application. Adel Neighbourhood Forum and significant numbers of local people individually have consistently objected to any development on this site. However we recognise that with outline planning approval having been granted, some development will take place on the land to the west of the beck running through this site. We and many others have articulated that this site is of particular significance in view of its heritage and landscape context. We are bitterly disappointed with the submissions made by the developer in this Reserved Matters application as they show a blatant disregard for any of the views of the local community and in effect are stating their views are irrelevant. This follows on from feeble efforts to carry out any sort of local consultation. It is therefore with regret that we have to address the detail of these submissions in the hope that the Council will be able to take a more robust stance when it comes to consideration by the Plans Panel. We have examined the “Design and Access Statement” submitted in support of the application. It contains numerous inaccuracies, half-truths and misrepresentations and needs to be read with a sceptical eye. We note that the West Yorkshire Archaeology Advisory Service has recommended that this planning application be deferred until such time as a proper investigation of this site has been completed. The Service refers to crop marks indicative of a Roman Road crossing the site. We understand that this Roman road may well be the important road from Manchester to York meeting the already known Roman Road in Adel (from Ribchester to York). If that is the case, this has important ramifications for the significance of Adel as a settlement in the Roman period. The line of the crop marks continues into the recent Barratt David Wilson Homes ( BDWH) development which they named “Centurion Fields”, acknowledging the Roman legacy of this location. BDWH did not conduct a proper archaeological investigation of that site . It is disappointing that Leeds City Council did not demand a proper investigation; the failure to do so means that important archaeology has probably been destroyed by that development. This must not be allowed to happen again and we strongly endorse the recommendation of WYAAS that this application be deferred pending proper archaeological investigation and then re-considered when the results of that investigation are known. Subject to the overriding issue above, we have the following observations about the proposed development, reminding ourselves that the site is opposite a Grade 1 listed, 12th century Norman church of national importance, opposite Adel conservation area and adjacent to landscape classified as a Special Landscape Area. The Design and Access Statement (“DAS”) seeks to downplay the sloping nature of the site. At 3.0 it states “Generally the site has a gently sloping platform, the highest point being 134m AOD on the south-east and south-western corners, falling to 129m AOD in the north-east and north-western corners.“ What the DAS should have added is that the site falls a further 10 metres down to the beck running through the middle of the site and that the site is therefore quite steep in places. The site slopes quite steeply about 50 feet down to the beck from the plateau on which Adel churchyard stands. This is important in understanding the visual impact the development will have from the churchyard and conservation area. We can only assume that BDWH are asserting that the site is almost flat to support their incorrect assertion that it will be blocked from view from the churchyard by newly planted trees. It is on this steep part of the site where BDWH proposes that school sports pitches be placed; that would be impossible without significant earthworks and terracing. This is a major issue which would have significant cost and quality implications and it needs to be addressed now. Similarly, the land slopes quite steeply from the Northern edge of the site in a North-Easterly direction down to Adel Mill. Houses on the Northern part of the site will be very visible when entering Adel from the North East and would need to be screened by a substantial shelter belt. Part 3.0 of the DAS goes on (at page 10) to provide a very misleading description of the context in which this site is located. It asserts that the land to the west of the site comprises “The prominent Lawnswood Arms public house and a mixture of 1930s and 1960s semi-detached houses”. Infact these are on Otley Road and are invisible from the site because only a tiny portion of the western side of the site actually abuts Otley Road- and that is partly screened by mature trees. The great majority of the western side of the site abuts woodland garden surrounding Adel Willows. This is not “a strong residential boundary” as asserted. At 5.0 of the DAS it is asserted that “Existing views from the Church directly west currently terminate on the housing on the West of Otley Road creating a suburban view.” This is simply not true. Views west from the church terminate at the trees surrounding Adel Willows which is between the church and Otley Road and blocks any view of Otley Road. The assertion at 5.0 that “New woodland planting within the site will ….create a more rural view..” is similarly untruthful for the reasons set out above. The east of the site is farmland; the conservation area, Grade 1 listed church and related buildings stated to be at the east of the site are actually beyond the farmland. The north of the site is also farmland, again with listed buildings beyond. The only boundary with any significant level of buildings adjoining is the short southern boundary where a recently planted shelter-belt is overlooked by the BDWH Centurion Fields development. The southern boundary is short compared with the other boundaries. Approximately 85% of the boundaries to the site adjoin farmland or wooded areas. It would appear that BDWH are attempting to create a false impression that this site is a suburban location such that its current proposed development will fit in and cause no detriment to the outlook from the churchyard and conservation area. The aerial photograph at the front of the DAS show a truer picture of the site which will be confirmed in a site inspection. Before any reserved matters consent is granted, a site inspection is essential and an accurate representation of the topography and site environment fully presented. English Heritage (as it then was) recommended in 2014 in relation to this site: “The design and materials used for the new buildings will affect the extent and nature of the visual impact of the development when viewed from the church. Therefore, ensuring that the design and materials reflect the local built character will be a critical part of the reserved matters stage. High quality, local materials should be used taking reference from the existing character of the settlement”. As to materials, BDWH say nothing in their proposal. This lack of transparency is of concern and leads us to assume they intend to use materials similar to those in their recent developments at Centurion Fields and Bodington Hall. Apart from the aberration of BDWH’s Centurion Fields development, the building material exclusively used in the neighbouring structures to this site (Adel church, rectory and stables, Adel Willows and Adel Mill) is Yorkshire stone. We would expect this development to be constructed in natural Yorkshire stone. BDWH will sell these houses at a significant premium because of the special location and the use of natural stone will not impede the commercial success of the development. English Heritage also advised in 2014 that” the height of the proposed new dwellings along the west edge of the beck should ideally be 1.5 storeys…..” At the time of the outline application, BDWH stated that the sight might indeed include 1.5 storey dwellings. In fact, none appear anywhere in this proposed development and again English Heritage advice has been ignored. As to character, BDWH claims (Design and Access statement 6.0) that it achieves a green standard. In fact, the proposed houses (according to the drawings submitted with the application) are just standard BDWH house-types in artificial stone with plastic windows which can be found anywhere in the UK. The only ”local” character they reflect is recent BDWH houses. The mediocre design of the proposed development is just not good enough for this special site and goes nowhere near meeting the English Heritage recommendations. This is not just a question of house design but also other factors such as inappropriate boundary treatments which clearly do not match their setting (contrary to the assertion at 6.0 of the Design and access statement). The overall design of the site shows no sensitivity whatsoever to the rural location. It is particularly disappointing to note that whilst BDWH are instructing a firm of architects who designed an award- winning site at a similarly sensitive location (Church Fields, Boston Spa), they are apparently only using them for site layout of BDWH standard units. We believe BDWH should be required to allow their architects to start afresh and design something good enough for this special site. The assertion by BDWH (Design and Access statement 6.0) that this proposal provides a “varied [housing] mix which would address local housing needs appealing to the needs of all members of the community.” is nothing short of disingenuous. 100% of the houses available on the open market under this proposal are 4 or 5 bedroomed. None is likely to be marketed at much under £500,000. Despite BDWH’s assertions, the development they propose will do nothing at all to address local needs. 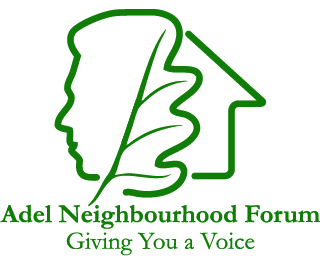 Adel Neighbourhood Forum requested a Housing Market Needs Assessment in June 2014 (subsequently commissioned by Leeds City Council) which demonstrated a need for smaller homes suitable for down-sizing by older residents. This need is regularly raised by residents at Adel Neighbourhood Forum meetings. Adel Neighbourhood Forum and our local councillor have raised this as an issue with BDWH on numerous occasions over recent years but have been consistently ignored, with no open- market houses of fewer than 4 bedrooms being offered on the BDWH sites at Centurion Fields or Bodington Hall or under the current proposal. As a result, older members of the Adel community have reluctantly remained in larger properties, meaning that these are not then available for younger families and those who do downsize have had to leave Adel. One such resident is our local historian and church warden. Our community is very much diminished by the loss of these people and this loss cannot be allowed to continue. It would make much more sense for the current proposed development to include small and medium-sized open- market properties for people to downsize into, thus enabling those who choose to, to remain part of the community, and releasing their family-sized homes for families moving into Adel. Nor are there any bungalows as intimated in the application for outline consent. Bungalows are important not only for older citizens but also for people with disabilities. The lack of smaller and mid-sized open-market houses in the proposed development also means there is nothing within the price range of any but the wealthiest young families. Development which excludes older citizens, those of all ages with disabilities and young families cannot honestly be described as sustainable. Development East of the Beck. In common with Historic England, Adel Neighbourhood Forum (ANF) remains strenuously opposed to any development East of the beck because of its impact on the environment of the Grade 1 listed and nationally important Norman Church and its churchyard. ANF was particularly disturbed by the decision of planning authority to disregard the advice of statutory consultee Historic England even before that advice had been received. We are aware that this has been the subject of an ombudsman decision. That decision raises further questions about which we are considering our position. ANF previously objected to the location of playing fields and associated fencing to the East of the beck; that objection still applies, particularly when one takes account of the earthworks and terracing which would be required and which have never been mentioned by BDWH. These will have a significant effect on this sensitive landscape. This important issue needs to be addressed urgently as it will have implications both for the landscape and for the costs and quality associated with the creation of a school on this site. The Forum is particularly concerned at BDWH’s attempt to introduce further development East of the beck. In the consultation documents submitted in 2016 for the outline planning application, apart from the playing fields, the only changes shown East of the beck were tree-planting and the construction of two ponds to contain possible floodwater. This is wholly unacceptable. If a pumping station is required it should be placed to the West of the beck in place of one of the proposed houses. ANF has been told by a Planning Officer that consent for the pumping station has already been given . If that is the case, that decision was made without consultation with the public or with statutory consultees and was therefore ultra vires and unlawful. It must be revoked. No temporary site depot or buildings should be allowed east of the beck at any time. BDWH will have plenty of space on the site west of the beck, particularly given the availability of the land reserved for school buildings. This path (crossing the Southern part of the site from west to east) is known locally as the Corpse Way because it was used historically for carrying the dead from the west of the parish to Adel church. The path is ancient and marked at each end and near the beck with ancient stone stiles and steps. The current proposals completely obliterate this ancient footpath west of the beck and are wholly unacceptable. The line of the existing right of way is arguably retained if one crosses and re-crosses road, pavement and verge (although we doubt the accuracy of the route on BDWH’s plans), but there is a significant difference between preserving a bare right of way and preserving an ancient footpath. It goes without saying that the ancient stiles and steps must be preserved. But the form of a proper footpath must also be retained. Previous iterations of BDWH’s proposals for this site have shown it as remaining a footpath with wide verges and scope for tree planting. This is what was recommended by the Landscape Team. The proposed substitution of a line along an estate road/pavement/verges is not acceptable. We understand that BDWH have no particular proposals for this footpath on the eastern side of the beck. However, we understand that the Highways Department is imposing a condition that it should be converted into a 3 metre wide hard-surfaced footpath and cycle path. This ill-considered decision made without any consultation wholly ignores the universally- accepted need to maintain the rural character of the fields to the east of the beck. There is already a perfectly adequate surfaced foot and cycle route to the site via Centurion Fields. The path should be left as it is. In any event, this site does not extend as far as Church Lane. Leeds City Council only has jurisdiction to impose planning conditions in relation to the land which is the subject of the current planning application. Any condition requiring this footpath to be hard surfaced right up to Church Lane would be ultra vires and unlawful. It is therefore futile for Leeds city council to impose any condition in relation to any part of this footpath east of the beck. Given that there can be no hard surfacing of this path, there will be no increased demand to cross Church Lane to reach it so there need be no construction of a raised pedestrian crossing in front of the church. In any event there should be no such urbanizing of the sensitive area in front of the church without the support of the Adel community following thorough consultation. A large number of trees on the North Western part of the site are protected by TPOs. If developers are allowed to fell such trees, the whole concept of TPOs becomes pointless and Leeds City Council’s position totally undermined. If TPO-protected trees have to be felled in order to enable access from Otley Road to this site, then the number of trees to be felled should be kept to an absolute minimum for that purpose only. It would appear from their plans and drawings that BDWH are also proposing to fell TPO-protected trees in order to get more houses onto the site; this is wholly unacceptable: BDWH should be required to build a safe distance around protected trees. These trees are not only important in their own right; as the Nature Team has pointed out, they provide a valuable corridor for bats and other wildlife. BDWH should be required to include in their planning documentation a plan of the site showing the location of protected trees and which of those trees they propose to fell, along with their justification for so doing. As stated above, a shelter belt (of at least 10 metres) is essential on the Northern edge of the site. As recommended by Historic England, shelter belts East of the beck screening the proposed development from the churchyard are also essential. ANF is disturbed to note that the current plans show far less extensive planting than shown on the plans submitted in the outline planning application. Given BDWH’s poor record in relation to shelter belts and landscaping locally (they only planted the agreed shelter belt north of Centurion Fields under pressure of enforcement action) no construction on the site should be allowed to commence until the shelter belts have been planted. The outline consent includes the reservation of land for a primary school. We understand that Education Leeds policies require any such school to be two form entry. This means that the school will have about 400 pupils and perhaps 50 staff. The land reserved for the school buildings has very little space for parking. It is well established that schools in North Leeds generate a huge amount of traffic. Much of the traffic for this school will attempt to park on the estate roads on this site. The proposed roads are simply not wide enough for this purpose and need to be made much wider and/ or to be provided with a substantial number of parking bays to meet the demands of school traffic whilst maintaining the ability of residents and the emergency services to use the roads easily and safely. Whilst ANF believes that the proposed layout for the junction with Otley Road will work tolerably well for the journeys generated by the new housing on this site ( providing no-one is any hurry to turn right out of the site during rush hour), the planned junction will plainly be unable to accommodate the additional traffic generated by the parents of 400 pupils and 50 staff entering and leaving the school each day. Otley Road is already busy and will only become busier as a result of new developments in Bramhope and Otley. The junction as designed will be unworkable and dangerous if a school is built on this site. ANF is also concerned that school traffic has the potential to cause congested and dangerous conditions on Centurion Fields, Church Lane, the Kingsleys and the Gainsboroughs. If the housing mix included adequate provision of houses for older people, that would reduce the numbers of journeys to and from the site during rush hour. If the school is built, it will almost certainly be built after BDWH have built and sold their houses. BDWH appear to have given no thought to the impact of school traffic. BDWH must not be allowed to leave a legacy of parking chaos caused by the construction of inadequate estate roads. The proposed development will fail to achieve a green standard for parking contrary to what is asserted at Design and Access Statement 6.0. ANF endorses the proposal that no traffic other than emergency services should be allowed to enter the site via Centurion Fields. But this must be the position from the outset. No traffic (and especially no construction traffic) to the site should be allowed via Centurion Fields at any time. No good reason has ever been provided for vehicles from a number of the proposed houses to be allowed to enter and leave via Centurion Fields for a limited period. The exceptional landscape and heritage factors mentioned above mean that a density lower than a suburban norm should apply to this site. BDWH are trying to cram far too much onto it to try to make up for the ruling that they may not build to the east of the beck. Units 26-29 and 35 &36 should be deleted. They are ridiculously cramped- essentially shoe-horned into what should be the gardens of the surrounding houses. They are overcrowded in themselves and detract from the houses which surround them, both in terms of overlooking and outdoor space. As an alternative, the inclusion of some smaller open-market housing for down-sizing or young families might free up some space. BDWH need only look at the housing at Eddison Walk in Adel to see how reasonably dense single storey development with private outdoor space can be achieved. The inclusion of a Northern shelter belt, the retention of more protected trees and the construction of wider estate roads all mentioned above will also impact on density, but should not prevent BDWH building the 80-or so houses envisaged in the draft site allocation plan. There is a lack of clarity as to what green space is to be provided within this development. Apparently there will be none amongst the houses themselves. That might possibly be acceptable providing adequate land is dedicated for green space/recreation to the east of the beck. Given that the land east of the beck cannot be built on, BDWH can afford to be generous with the provision of green space. ANF does not accept that this site is an appropriate location for a new primary school. The two existing primary schools are also located in the north east of Adel and it is makes no sense to locate a third primary school in the same area. The two existing schools already generate a high volume of traffic from other parts of Adel which endangers children trying to walk or cycle to those schools. The building a third school which would generate similar traffic problems is not sustainable. There are better and more sustainable sites in Adel for a third primary school. In the public meeting, BDWH representatives appeared to concur with our belief the school should not be built on this site, putting forward HG1-60 Adel Reformatory Site as a better option. There has been no discussion about this possibility and we would see this site as inappropriate given its close proximity to Adel Primary School. However we recognise the rationale for the developer that they would see this as allowing more houses to be built on the Church Lane site. The document lodged by BDWH shows what scant regard BDWH has for consulting the Adel community about this development. It is the same document filed for the 2016 outline application. Again it does not include the appendix referred to, which was the document supposedly circulated in the “community”. For the record, that document was only circulated to about 10% of Adel households even though a development affecting the church and conservation area impacts on all Adel residents. It was not even delivered to the neighbouring houses on Centurion Fields. The document itself had no element of consultation. It simply stated that this was what BDWH were going to build, that a planning application would be submitted in the next couple of weeks and that any questions about it should be sent to BDWH. BDWH had to be persuaded by our local councillors to hold a consultation event on the current proposals. BDWH did display its current proposals at Adel Stables on 5 June and the event was well attended. BDWH did make forms available for comment and many comments were made. However, BDWH has not acted on any of them and this leads us to believe that they were only going through the motions in holding this event. Adel Neighbourhood Forum reluctantly now accepts that some housing development will take place on this site but are bitterly disappointed that BDWH have shown no evidence of being willing to listen to the local community or indeed some of the statutory consultees. As a result, the development is likely to be severely damaging to the local area as set out above. The view of the developers appears to be that Leeds City Council will not wish to face a legal challenge if it opposes BDWH proposals. Despite platitudes in consultation BDWH are continuing to show a determination to build a mundane standard of design similar to that in other BDWH developments across the UK and are replicating the adjoining Centurion Fields development which they themselves acknowledge has not been a design success. We have consistently asked for CGI interpretation of how their proposed development will fit in the landscape. Their failure to do so suggests an arrogance that the impact on the local community is irrelevant. The design of the proposed development shows a determination just to cram as many maximum- profit houses as possible into the site. Adel Neighbourhood Forum believes that these issues need to be rigorously challenged by the Council before consideration by plans panel, and that crucial information be provided so that appropriately informed decisions can be taken. Planning Application in Adel for 100 dwellings and school. Please see the Reserved Matters application by David Wilson Homes for the land opposite Adel Parish Church. Proposal: Residential development (Use Class C3) for up to 100 dwellings and land reserved for primary school with construction of vehicular access from Otley Road, to the north west and Ash Road to the south, areas of open space, landscaping, ecology treatments and associated works. Details of the application may be viewed at the web site below, or by accessing IT facilities in the library at Ralph Thoresby or at Merrion House, address below. Alternatively, you can go to the website address below and then insert the application number 18/04343 and press “search” and the information above should come up. You can then click on the associated documents if you wish to see what the documents are and you can look at all the individual documents. Please quote the planning reference number, noted above, with your comments. The closing date for comments is 24th August 2018 but Planning will accept comments after this date if circumstances prohibit you from submitting your comments by the due date.